4) change fopen() to use binary-mode, etc. That pthread_kill(SIGUSR,...) call wakes up the CPU thread when it's sleeping (when the A/UX scheduler calls the 'stop' instruction) -- but hey, if it works, then whatever Worst case scenario, there'll be some random 1-second lags. And also thanks for reverse engineering the CLI arguments for emendelson. XD I'll dump a help string to stderr / document it on the wiki once 0.0.4 is released. Guess I'll be able to release a windows build simultaneously! Oh ntohl are in winsock, I had to include the winsock header, and link against the winsock library (it provides TCP/IP for windows programs). I've run shoebill.exe under wine, lol it works great! I ended up hacking up the makefile a bit, and making a 'build' script for the final exe, but it's nothing terribly complicated. One strange thing is your fixup perl script, when it tries to insert comments in the fixed up core file, it puts something binary in there, and corrupts the C file... so I commented out that section of the script and it works fine. Now we just need PRAM to get saved/restored in a way that the mouse double clicks live between reboots.... and Ethernet so we can network this bad boy! So as you can see I didn't change all that much. .... and Ethernet so we can network this bad boy! I don't know what I did, but sleeping is now working with the signals! .. on AUX 2 only though, 3.0.0 hammers the CPU like crazy... maybe it's me. I think I'll just replace signals with pthread_cond_wait(). That should better support non-UNIXy platforms. Last edited by pruten on Wed Jun 11, 2014 5:05 am, edited 1 time in total. also my build with signals inside locks tight after a few minutes.... I need to re-test the one without now. Great to see a Windows build! I can get to the desktop with it using AUX 2.0 (but then hangs). Not with 3.0.1. It's not you, it does the same thing with me... and 2 actually idles, while 3 runs 100% .... I havent tried 1.1.1 yet, but at this point I think we are at the 'wow it compiled' phase... at least it isn't 0xc0000005'ing. 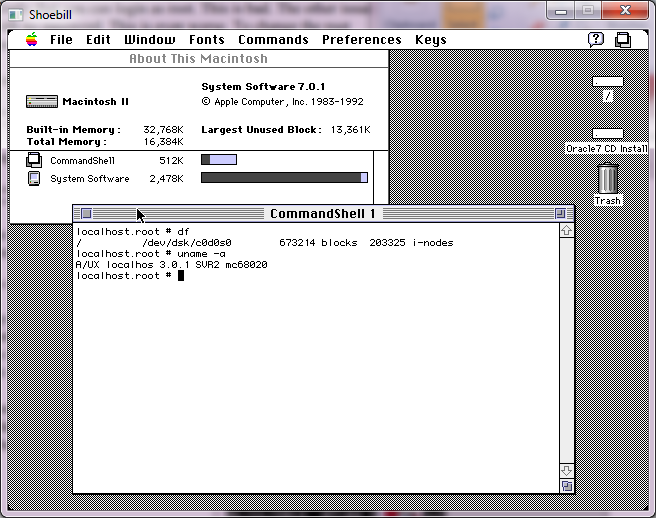 Actually, the command shell on 3.0.0 will soak 100% of the CPU. huh. Anyways either close it, or logon to a full screen console, and CPU utilization on 3.0.0 is near nill. If the missing pthread_kill() is at fault, then there's an easy solution: comment out the Sleep(1) in cpu_thread as well. That'll drive up CPU use to 100% all the time, but otherwise work "correctly" from A/UX's perspective. Even when "stop" actually stops the CPU thread, certain Mac OS apps eat up all the cycles anyways. So it's of limited use. From a feeble gdb session all the threads were sleeping waiting for something.. Almost like too much sleep and everything falls apart. AUX 2 certainly sleeps more than 3 (the console window..... grr) so I guess thats why 2 feels worse than 3. Maybe a mutex around the sleep? I donno, I never was that good with multithreaded stuff.... by the time I got a C compiler and a threaded OS (lol OS/2) it didn't matter I was working. Anyways AUX 2 has been running for over 2 hours now, so I've replaced the binary/source on my site. the changes are now even less significant.... but im happy it's working! Sounds like the CPU thread isn't waking up when it's supposed to. I just went with sleep(1) and pthread_kill() as a method for pausing the CPU thread because it's simpler (and therefore maybe faster?) than using regular pthread condition variables. But since it's making cross-platform life difficult, I'll just switch over to pthread_cond_wait()/pthread_cond_signal(). No problem. I'm still amazed from your first public release.. I'd felt so bad having to give up my quadra 700 years ago, as I figured I'd never boot A/UX again... but here we are! I'm using a mingw toolset that I found for building PCem (another fine emulator, if I do say so) it's something I snagged from here, 23MB or so, kind of tiny. I just had to add in the SDL2 stuff. So as you can see it's quite minimal! Woah, great progress! This website's email notifications was broken, so I couldn't see the progress on getting this to run on Windows. Yeah I kept on seeing people wanting a Windows version of Shoebill, and luckily it's written well enough with a few trivial changes it works! I hope one day we get Ethernet so we can setup httpd, mud, irc and maybe even quakeworld servers! It's going to be awesome! If anyone wants them, I found the A/UX 1.0 installation manual, and the A/UX 2.0 installation manual. I haven't seen a 3.0 one.. yet. I finally got that ancient "aux-0.7-bin.tar.gz" thing floating around onto A/UX 3.0.0, and much to my amazement, the userland stuff that I tested (df, ls).. actually work. Now to see if I can get it to boot.. or self host! Oh yeah, and without a network, the easiest way to move stuff around is uuencode. its the only thing I could use BasiliskII to copy to the HFS volume, and then get finder to copy reliably to the UNIX side of A/UX. I accidentally tried to boot 3.0.1, and it got me thinking the UNIX kernel boots up ok, it's the toolbox side of things that doesn't work. So what happens when you replace /mac from a 3.0.0 install onto a 3.0.1 setup? I did the dump/restore shuffle, and got a booting system. my feeble attempts at mixing and matching 3.0.1 and 3.0.0 has just left it unbootable, I dont even know which process locks when trying to do the login screen, but yeah if you want a newer kernel this works. I don't think the II is supported on later patches though. Is how I should have done it... I was always getting dup alloc 1 failures if shoebill or aux crashed on reboot. I'll update the blank disk images later. I know it's a known issue, but I thought it was at least somewhat interesting the kernel boots! 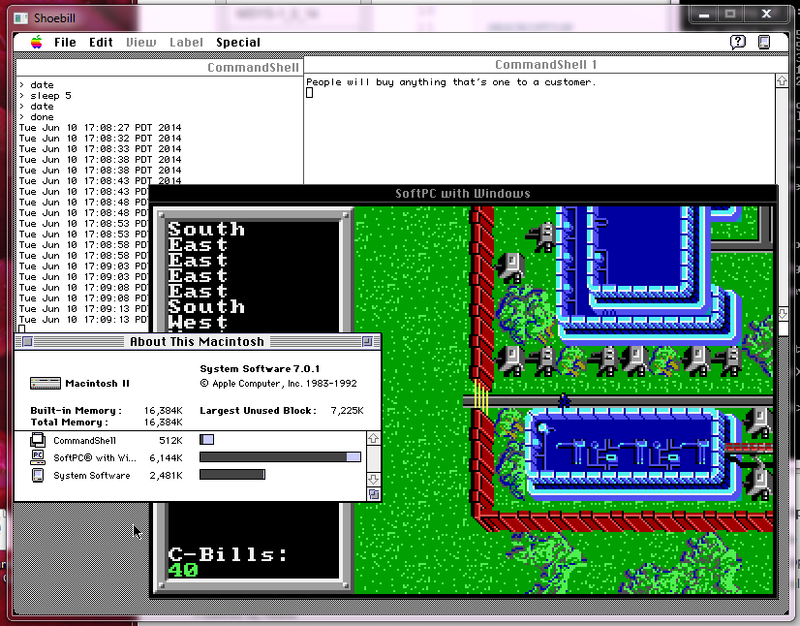 Yeah, your 68020 emulation is pretty commendable! I'm still amazed it runs SoftPC! I'm glad I kept a copy of that ancient thing hanging around!